Capital Freehold, Copyhold and long leased Property at Brighton and Horsham in the County of Sussex. 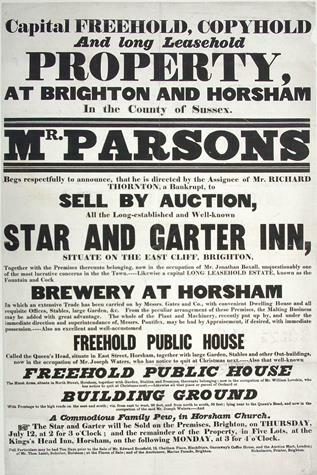 Mr Parsons begs respectfully to announce that he is directed by the Assignee of Mr Richard Thornton, a Bankrupt, to sell by Auction, All the Long Established and Well-known Star and Garter Inn situate on the East Cliff, Brighton. The Star and Garter will be sold on the premises, Brighton, on Thursday July 12th at 2 for 3 o’clock; and the remainder of tjhe Property in Five Lots, at the King’s Head, Horsham, on the following Monday at 3 for 4 o’clock. Full particulars may be had ten days prior to the Sale of Mr Edward Bousfgield, 12 Chatham Place, Blackfriars, Garraway’s Coffee House, and the Auction Mart, London; of Mr Thos.Lamb, Solicitor, Horsham; at the Place of Sale; and of the Auctioneer, Marine Parade, Brighton. Please report any errors to The Friends of Horsham Museum. Images and text are copyright of The Friends of Horsham Museum and Horsham Museum. Contact Horsham Museum to obtain high quality prints or permission for commercial use.